David Morris (left) is someone I've been honored to have as a friend for many years now so I know of what I speak when I say this: David Morris is like the Chuck Norris of renaissance men! This guy does everything, including competition roller skating and (along with his wonderful wife Gretchen) being active in the Theatre Guild of Rockingham County. David and I first met because of our mutual love for astronomy. But David, being David, took his passion to the max and pulled off what most amateur astronomers only dream of: his very own observatory! 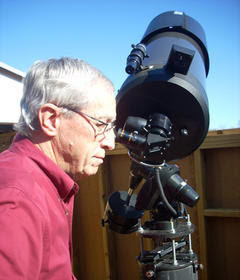 Here's an excellent write-up in today's News & Record about David and his homebrewed facility, which he has christened Smithstone Observatory.